Seems like I’m getting off to a great start on my effort to read more fiction—possibly to the detriment of my writing, but … doubt any of these books have taken away a moment of time when I both had the energy and the inclination to write, so I don’t really believe that. See this book? It’s by one of my favorite authors. It’s been sitting on my side table since September last year. I finally started it in December, and for some reason stopped and that bookmark’s been there ever since! I liked this book; I have no idea why I haven’t finished reading it yet. It’ll probably end up as one of my 60 this year. 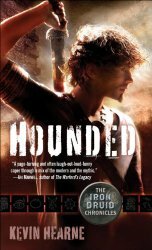 Anyway, Hounded is the first book in The Iron Druid Chronicles, a series I’ve been meaning to read for a really long time. I’m glad I finally got around to the book because I really enjoyed it. Lots of action, lots of humor, and lots of fun.